Omega's De Ville collection has been known for its classic, elegant watches for decades. Hand-made calibers with tourbillons are among the gems of this series. The cases are made of stainless steel, gold alloy, or platinum. The Omega De Ville collection offers a wide selection of traditional designs paired with modern calibers. It ranges from simple three-hand models with a date display to platinum tourbillon watches. There are also many women's models available, each studded with diamonds. Due to their classic designs, most of the watches in the De Ville series are best suited to formal occasions. They are the perfect accessories for the office, a wedding, or even an evening reception. Thanks to their chronometer-certified Co-Axial calibers, De Ville watches are extremely precise, reliable, and efficient. Top models even come with Co-Axial Master Chronometer certification and can resist magnetic fields up to 15,000 Gauss , making strong magnetism no match for these timepieces. While they may look different from the sport watches in the Speedmaster and Seamaster collections, the watches in the De Ville series are their technological equals. How much does a De Ville cost? 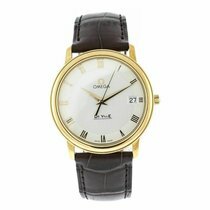 If you're searching for a dress watch from Omega, the De Ville collection is the right place to start. 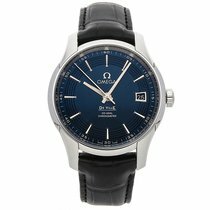 Omega offers a wide range of classic men's and women's models in this collection. Models with gold, platinum, or diamonds often make solid investments. 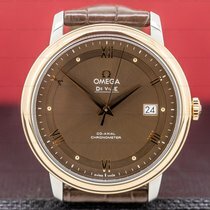 Omega also covers a wide range of prices with this collection: starting with quartz watches that cost around 1,100 USD and going all the way up to platinum watches with a tourbillon that cost more than 460,000 USD. You can purchase pre-owned vintage models for as little as 350 USD. Newer gold models cost between 5,700 and 22,800 USD. These watches go wonderfully with a suit or evening gown. These timepieces are best compared to watches from Patek Philippe. Omega uses state-of-the-art Co-Axial technology in the De Ville collection, improving the watches' precision, power reserve, and efficiency. Thanks to anti-magnetic silicon components, the watches are unaffected by magnetic fields. If you want a particularly exquisite watch, the De Ville Central Tourbillon is the watch for you. This limited edition timepiece is 38.7 mm in diameter and has a skeletonized dial and movement. Materials such as platinum, red gold, and diamonds make it even more valuable. For example, one model features approximately 170 baguette-cut diamonds; even the movement is adorned with over 280 diamonds. The gray leather strap features platinum stitching. The Co-Axial caliber 2637 also has a winding rotor made of platinum. This diamond-studded platinum watch has an official list price of 725,000 USD. Only 3 examples of the timepiece exist. The version without diamonds is markedly more affordable: Mint-condition pieces sell for just over 250,000 USD. The red gold variant is even less expensive. Plan to spend around 76,500 USD on this model. Pre-owned watches are available for around 40,000 USD. The list price for the red gold edition with a diamond-studded bezel sits at 210,000 USD. If 38.7 mm is too small for you, you may enjoy the 44-mm De Ville Tourbillon Co-Axial Blue Edition. This Sedna gold timepiece with a blue dial officially costs 156,000 USD. Each watch in the De Ville Central Tourbillon series is handmade by a single watchmaker over the course of more than 500 hours. The name of the master watchmaker is engraved on the tourbillon's main plate. The watches in the De Ville Trésor collection are especially thin and made of high-quality materials. The 40-mm edition has a 10.6 mm thick case made of 18-karat yellow, white, or Sedna gold. Sedna gold is Omega's in-house red gold alloy composed of gold, copper, and palladium. Classic black or brown leather straps with polished gold clasps keep these timepieces on your wrist. Along with most of the cases, the indices and hands are made of gold. The domed, silver dials feature a date display at 6 o'clock. There are also limited editions featuring glossy, enamel dials in white, blue, or ivory, as well as exclusive models with diamond-set indices and bezels and mother-of-pearl dials. If you're looking for a simple version of the De Ville Trésor, you should take a closer look at the three-hand gold models with a date display at 6 o'clock. The white gold variant with a blue dial is listed at 19,100 USD and limited to a run of 88 pieces. Finding a watch with a silver-colored dial is much easier. This model demands around 10,300 USD in mint condition and 8,800 USD pre-owned. Editions in yellow or Sedna gold cost a few thousand more. The collection also includes 36-mm quartz watches in stainless steel with diamonds on the case. Thanks to their modest size, these models are an option for both men and women. That being said, their shiny and curvy looks are rather feminine, making them better suited for women. A mint-condition timepiece with a blue leather strap and dial costs almost 3,500 USD. The modern Trésor models pay homage to Omega watches from the late 1940s, which were powered by the legendary 30-mm caliber. This large manual movement, which has been powering watches since 1939, masterfully fulfilled all requirements set forth in the Swiss observatory tests and ran incredibly precisely. Omega is one of the few manufacturers who has always participated in these tests. The manual caliber 8511 also runs as precisely as a chronometer and powers current Trésor models. The Swiss manufacturer uses their in-house Co-Axial escapement in this movement, an alternative to the commonly used Swiss anchor escapement. The Co-Axial escapement is known for its high level of precision due to its improved energy efficiency and reduced friction. This results in a double barrel movement with a 60-hour power reserve. It also has a freely oscillating silicon balance spring, which makes it resistant to magnetic fields up to 15,000 Gauss. Thanks to the sapphire glass case back, you can watch these manual movements in motion and admire the red gold balance bridge with Geneva stripes. Omega engraves the words "Anti-magnetic" and "> 15'000 Gauss" on the case back as well. In 2007, Omega took transparency to the next level with the introduction of their unique De Ville Hour Vision watch. The Hour Vision gives the wearer a clear view of not only the movement's face, but also its sides. Stainless steel versions with three hands, a day-date display, and a stainless steel bracelet feel sporty yet sophisticated. Roman numerals underscore the elegance of this anti-magnetic Co-Axial Master Chronometer. At 41 mm in diameter, this timepiece will fit on almost any wrist. You can get a never-worn example for about 7,700 USD. If you prefer something a bit more refined, you may enjoy the Sedna gold version with a dark blue dial. The blue leather strap matches perfectly to the dial, just as the pink gold hands and indices match the case. Set aside around 17,100 USD for this luxury timepiece in mint condition. The Omega De Ville Hour Vision Co-Axial Annual Calendar is one of the series' highlights. This 41-mm watch comes with an annual calendar and your choice of a stainless steel or gold case. With a leather strap, the stainless steel version demands about 7,400 USD. Pre-owned examples are slightly more affordable at 5,900 USD. A mint-condition timepiece in red gold with a matching gold bracelet costs around 29,700 USD new. These watches are powered by the automatic caliber 8500, which was brand new at the time of their release and serves as the base of current calibers. The movement was developed around the turn of the millennium in collaboration with the world's largest ébauche manufacturer and fellow Swatch Group member, ETA. One highlight of the 8500 is its Co-Axial escapement. It has been improved in several other ways as well. It now includes a winding rotor with low-maintenance zirconium-oxide jewels, a larger escapement, and two barrels instead of one, which provide it with a 60-hour power reserve. The adjustable second hand is also a practical addition. Mechanical calibers often only have a balance stop or the second hand doesn't stop at all. Omega currently uses the newest generation of their Co-Axial Master calibers in the Hour Vision series. Therefore, they're also unaffected by magnetic fields up to 15,000 Gauss. Some versions feature a calendar at 3 o'clock (caliber 8903), which displays the date as well as the current month. It only requires correction once a year on February 28th or 29th. Watches with caliber 8901 only show the date at 3 o'clock and not the month. Omega went a sportier route when designing the Hour Vision. At the same time, they incorporated classic design elements such as Roman numerals, Sedna gold cases, and leather straps in black, blue, or brown. There is also a wide range of dials available. Whether you prefer brown, black, silver, or blue, there's a color for you. If you're looking for something a bit sportier, you should take a look at the stainless steel models. They're available with a nine-piece link stainless steel bracelet and a 60-minute graduated scale on the rim of the dial. Bicolor dials in black/silver or brown/silver, along with the lugs, emphasize the watch's sporty look. All models are 41 mm in diameter. The De Ville Co-Axial series premiered in the late 1990s and laid the groundwork for the success of the Hour Vision. The watches in this series also have Omega's Co-Axial caliber, which is enhanced with a chronograph function. The three-hand version without a chronograph function is barely distinguishable from the Hour Vision, except for its lack of see-through case sides. However, you can still watch the caliber at work through the sapphire glass case back. Chronograph versions have a date display at 6 o'clock, small seconds at 9 o'clock, and the minute and hour counter at 3 o'clock. This chronograph is unique in that it keeps track of minutes and hours on the same subdial. It uses two hands to do this, a small one for the hours and a somewhat larger one for the minutes. Normally, a chronograph has two independent subdials for the hour and minute counters. At 42 mm, the size of this watch is a bit larger than the Hour Vision due to its use of caliber 9301. You have the choice between a stainless steel or red gold model, together with a matching bracelet or a leather strap. You can purchase a mint-condition chronograph with a stainless steel bracelet for just under 6,200 USD. Depending on its condition, a pre-owned example costs a few hundred dollars less. The price for a new gold chronograph with a brown leather strap sits around 19,900 USD. You can find pre-owned pieces for about 16,000 USD. Simple three-hand models in stainless steel with a date at 3 o'clock cost around 4,100 USD new and about 3,400 USD pre-owned on a black leather strap. Versions in red gold come in at around 12,600 USD in mint condition and 8,300 USD pre-owned. If the date is not enough information for you, you may enjoy the De Ville Co-Axial Annual Calendar . In addition to the date, this watch displays the month at 3 o'clock and only needs to be manually corrected once a year on March 1st. You can get a stainless steel model with a leather strap in mint condition for about 6,200 USD. Pre-owned pieces change hands for a few hundred dollars less. Those in red gold with a matching bracelet demand around 25,800 USD new. Omega offers over 100 women's watches in their Ladymatic series, which was first introduced in 1955. In the early 21st century, the series was updated with the newest technology. Automatic calibers 8520 and 8521, both with a freely oscillating silicon balance spring, power the Ladymatic watches. The 8521 has an 18-karat red gold rotor and balance bridge. The series proudly displays the words "Co-Axial Chronometer" on the watches' dials in honor of these high-tech calibers. The cases and bracelets in this series are made of red, yellow, or Sedna gold. Alternatively, Omega offers stainless steel versions with leather straps. Bicolor stainless steel and gold models round out the options. The variety of combinations available in the Ladymatic series is almost endless. Many of the watches have diamond indices and diamond-studded bezels. The dials are recognizable by their unique Supernova pattern. The Luxury Edition watches have shiny mother-of-pearl dials with diamond indices or a flower motif made of diamonds. Diamonds also cover the bezels of these luxurious women's watches. The Pearls and Diamonds model adds white pearls to the diamond-studded 18-karat Sedna gold bracelet. The result is a stunning bracelet with diamonds and pearls of various sizes. The Sedna gold edition of the Omega De Ville Ladymatic Pearls and Diamonds costs about 120,000 USD new. Steel watches with diamond indices and mother-of-pearl dials are much more affordable: You can purchase a new one for around 5,800 USD. At 23,200 USD, the Sedna gold version with a diamond-studded bezel and diamond indices is also more affordable than the Pearls and Diamonds edition. The men's and women's watches in the Omega De Ville Prestige series are classic dress watches. Clear, streamlined designs define this series. With the men's models, you have the choice between timeless, three-hand versions or those with small seconds at 9 o'clock. The latter also has a power reserve display at 6 o'clock featuring a small hand that indicates how much power the watch has left. The caliber 2627 has a 48-hour power reserve. The case measures 39.5 mm in diameter. For the case material, you have the choice between stainless steel or yellow, red, or white gold. The caliber 2500 powers the model with decentralized seconds, which also has a date display at 3 o'clock. These women's watches are available in four different sizes: 24.4 mm, 27.4 mm, 32.7 mm, and 36.5 mm. Omega uses precise electronic quartz movements in the smaller models. These watches can be recognized by their mother-of-pearl dials with butterfly designs, which have earned them the nickname "Butterfly." Diamonds and gold features add additional value to these watches. The women's versions are available with seven-piece link bracelets, either in stainless steel or bicolor. Almost every watch manufacturer of this quality has tourbillon watches on offer. The watchmaking genius Abraham-Louis Breguet developed the mechanism toward the end of the 18th century. His goal was to minimize deviation from the correct time caused by gravity in pocket watches. To achieve this, Breguet put the oscillation and escapement systems – the balance wheel, balance spring, anchor, and escape wheel – in a cage, which makes one full turn on its axis every minute. The cage's rotation compensates for the deviation and improves the timepiece's precision. Omega places this mechanism in the center of their Tourbillon watches, while also adding some modern design accents. Two hands keep track of the hours and minutes and almost seem to be floating above the dial. Omega manages this by setting both hands on sapphire glass. The brushed second hand is connected to the titanium tourbillon bridge and makes one rotation every 60 seconds in time with the cage. The Sedna gold dial has a blue coating with a sunburst pattern and is paired with an 18-karat, 44-mm Sedna gold case and Sedna gold indices. A matching blue leather strap allows the watch to rest lightly on your wrist. 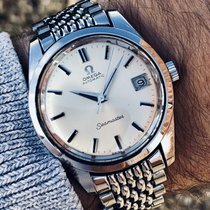 The watches in the De Ville collection have their origins in the Omega Seamaster De Ville, which was produced in the mid-1960s. The De Ville has been its own, independent collection since 1967. With it came a new Omega philosophy of creating classic, elegant watches . Accordingly, the watches weren't designed in their Biel headquarters, but rather in Geneva, Switzerland's watchmaking metropolis. Geneva represents watchmaking like no other city on Earth. World-famous luxury brands like Rolex and Patek Philippe have their headquarters there. The watches in the De Ville collection embody Geneva chic. Omega's designers paired rectangular cases with the super-flat manual caliber 620, connecting classic watchmaking traditions with modern 20th-century technology. This combination of progress and timelessness helped transform De Ville watches into icons of watchmaking history. The watches still retain these features today, pairing innovative technology with traditional designs.